_ I came across a cute country sign today that featured Santa in his long red coat holding a small Christmas tree. I’ve seen signs like this before and wondered about the message. You know what I’m talking about – those of you who really know the truth about Santa Claus. Believe in what? A generous man who lived far away, a long time ago and gave kids presents? The truth is, I’ve always leveled with my kids about the man in the red suit. When my boys were little I wanted to stress the true meaning of the holiday so much that I even banned pictures of Santa from my home. I was clear with my children on who Santa was and wasn’t and my gift tags declared that presents came from dad, mom, and the baby Jesus. I’ve relaxed a little since then, but I still get into trouble now and again. I remember the time my then four-year-old daughter told her little girlfriend (very much a Santa believer) that Santa was dead. I cringed when I heard that one – wanting to respect her family’s decision on how they present Santa in their home. _ It’s not that I’m a scrooge. I love Christmas – in fact I love it a bit too much as my husband will tell you when the spending starts. And I confess all the shopping, eating, and busyness of the season often distract my focus from the babe in the manger. But something inside me rises up when the Christmas message of belief gets twisted. 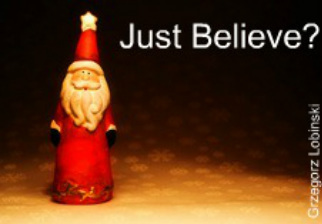 What are we supposed to be “believing” in during the holiday season? Hollywood has its answer for us loud and clear. The Christmas movie line up of “Elf,” “Polar Express,” and “The Miracle on 34th Street” may hold a special place in our hearts, but let’s take a step back from our emotions and take a look at what really is being communicated in these yuletide flicks. _ In “Elf,” Santa’s sleigh won’t fly until the folks in New York City believe in him. And in “Polar Express,” an unbelieving boy goes on a wild train ride and experiences a series of events in the North Pole that eventually restores his faith in Santa. And don’t forget “Miracle on 34th Street’s” Kris Kringle at Macy’s Department store. He was the real deal, wasn’t he? I guess the reason I wanted to avoid the whole Santa tale with my children was that I didn’t want them getting confused when they found out the truth. Wouldn’t they wonder if I was lying about the baby Jesus too? Please believe me, I’m not a Santa hater. I told you I’ve relaxed. We have fun with the make-believe part of it all and some of those movies I mentioned above are my favorites too. I’m just wondering if all this push to believe in the made-up magic of the holiday distracts us from the real thing. It takes our eyes off the incarnation don’t you think? Emmanuel – God with us. I discovered what has become one of my favorite images of Santa in a Christian book store a while back. Santa, fully garbed in fluffy red and white is kneeling in reverence before the baby in the manger. Now that’s a Santa I can believe in. I bought a crèche this Christmas. It’s big and has little pieces of dried moss hanging from the roof for a realistic effect. I thought my younger kids could get out the old, chipped nativity set and act out the story of the wise men, the star and the baby in the manger. And it is family tradition for us to count down the last days before Christmas by having one child a day set out just one piece from our good nativity set. The baby Jesus gets to be placed in the manger on Christmas morning. If you want to believe in something this Christmas, I encourage you to shoot for something big. Believe in someone that can take you through the year – well past the time when the stockings are stored back in the attic and that last pine needle is vacuumed up. Someone that can help you when things get dark and maybe a bit scary. Someone who promises never to fail you nor forsake you. No man in a red suit can do that for you. Jesus is the reason for the season.